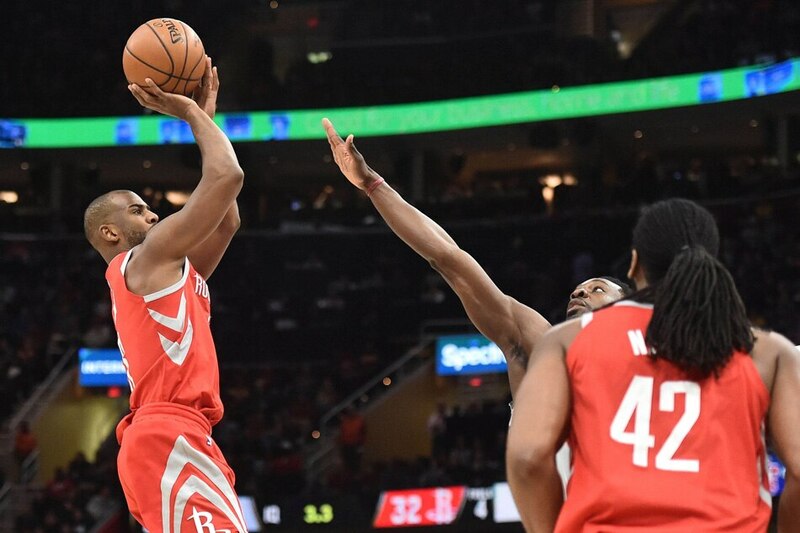 Chris Paul flirted with a triple-double and James Harden facilitated with ease as the Houston Rockets trounced the defenseless Cleveland Cavaliers, 120-88, on Saturday in Cleveland. Paul finished with 22 points, eight rebounds and 11 assists. The Rockets overwhelmed Cleveland from the perimeter, shooting 19-for-51 from 3-point range. Harden added 16 points, six rebounds and nine assists plus two steals. Cleveland had won 17 of its last 19 games at home, but the Rockets recorded at least 32 points in each of the opening three periods before turning to their reserves in the fourth. Isaiah Thomas and J.R. Smith paced Cleveland starters with 12 points apiece but shot a combined 9-for-25. LeBron James added 11 points, nine rebounds and nine assists but missed 7 of 10 shots. Host Denver became just the second team to beat Golden State twice this season, using a late 3-pointer by Nikola Jokic to cap a fourth-quarter rally that produced a victory. The win allowed the Nuggets to earn a 2-2 season-series split with the Warriors, with each team winning once on the other's home court. Will Barton had 25 points and Jokic 19 for Denver. Kevin Durant poured in a game-high 31 points for the Warriors, who were playing the second half of a back-to-back, having won at Sacramento on Friday night. Stephen Curry scored 24 points. Ricky Rubio poured in 34 points on 11-of-14 shooting from the floor and added nine assists to lead Utah to a victory at San Antonio. The Jazz have won five straight and six of their past seven games. Royce O'Neale added 18 points for the Jazz, who have beaten San Antonio both times the teams have played this season. The Spurs got 31 points from LaMarcus Aldridge but lost for the second straight home game. Tobias Harris scored 24 points on 10-for-19 shooting in his team debut, and host Los Angeles held off Chicago. Danilo Gallinari matched Harris' total with 24 points in his second game back from a muscle strain that forced him to miss 25 games. Lou Williams scored 21 points and distributed a team-high six assists off the bench. Zach LaVine scored 21 points to lead the Bulls in his 10th game since returning from a knee injury. Paul Zipser contributed 16 points, and Bobby Portis had 10 points and 13 rebounds, but Chicago lost its sixth consecutive contest. Otto Porter Jr. led five players in double figures with 20 points and Washington routed host Orlando. Washington matched a season high with its fourth straight win despite playing without the injured John Wall. Tomas Satoransky, who has started in place of Wall, hit 7 of 9 from the field and had a career-high 19 points. Bradley Beal finished with 18 points and eight of his team's 35 assists, while Markieff Morris scored 16 points for the Wizards. Ish Smith had 25 points and seven assists, Andre Drummond notched the 19th 20-20 game of his career with 23 points and 20 rebounds, and host Detroit won its third straight game by defeating Miami. Drummond also had four steals and four blocks. Blake Griffin struggled with his shooting in his second game with Detroit, going 6-for-19 from the field, but still finished with 16 points, nine rebounds and seven assists. Griffin was acquired from the Los Angeles Clippers on Monday. Anthony Tolliver, Langston Galloway and Stanley Johnson added 13 points apiece for the Pistons, who are 3-0 in their six-game homestand. Bojan Bogdanovic and Victor Oladipo scored 19 points apiece and Indiana played a strong second half en route to a victory over visiting Philadelphia. Lance Stephenson scored 14 points, Darren Collison contributed 11 and Thaddeus Young had 10 for the Pacers. Domantas Sabonis also had 10 along with eight rebounds and six assists. Joel Embiid paced the 76ers with 24 points and 10 rebounds. Embiid leads the Sixers with 29 games this season of at least 20 points. Jimmy Butler scored 30 points as Minnesota continued its mastery of New Orleans with a victory in Minneapolis. The Timberwolves completed a four-game sweep of the season series, having beaten the Pelicans by an average of 13.3 points. Minnesota won its 12th consecutive home game and improved its home record to 22-6. Karl-Anthony Towns added 22 points and 16 rebounds for Minnesota. Anthony Davis led New Orleans with 38 points, and he grabbed nine rebounds. Nikola Mirotic came off the bench in his first game since the Pelicans acquired him in a trade with Chicago on Thursday, scoring 18 points and grabbing 12 rebounds. Six players scored in double figures for Dallas, which rallied in the fourth quarter to dump host Sacramento. The Kings managed just 14 points in the fourth quarter, losing the lead for good when Yogi Ferrell drilled a 3-pointer with 10:38 left to make it 87-85. That was part of a 16-0 run to start the period by the Mavericks. Harrison Barnes paced Dallas with 18 points, while Norman Powell added 17 on 7-of-9 shooting. Rookie De'Aaron Fox and reserve Garrett Temple tallied 15 points apiece to top Sacramento.